A collaborative team of researchers led by scientists at the German Centre for Cardiovascular Research (DZHK) discovered that nearly half of all hereditary risk factors for coronary artery disease are also associated with entirely different diseases, such as schizophrenia, chronic inflammatory bowel disease, or migraines. This new study, published in the Journal of the American College of Cardiology through an article entitled “Systematic Evaluation of Pleiotropy Identifies 6 Further Loci Associated With Coronary Artery Disease,” further identified six variants in the human genome that occur more frequently in coronary artery disease (CAD). Investigators are now aware of 62 hereditary risk factors for CAD. “If we find an SNP that occurs significantly more often in people with coronary artery disease, we have in the first instance found a marker for the disease. The second step is to research how this variation in the genome is related to the disease,” explained co-lead study investigator Jeanette Erdmann, Ph.D., DZHK member, and professor at the Institute for Cardiogenetics within the University of Lübeck. Unlike monogenic diseases, which are caused by a single mutation in the genome, cardiovascular diseases belong to a group of complex disorders. Many factors like lifestyle, environmental influences, and hereditary factors determine whether an individual will be affected. An SNP associated with CAD does not cause the disease, but reveals something about the statistical risk of potentially suffering from the disorder. 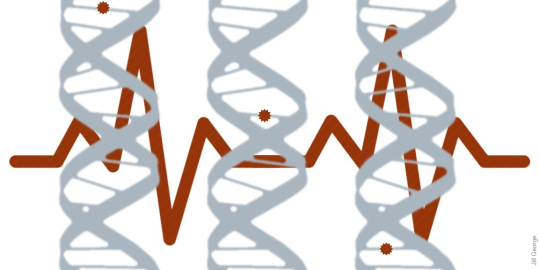 In their current findings, the researchers performed a genome-wide association study (GWAS) comparing the genetic sequences from 42,335 people with coronary artery disease and 78,240 healthy people against 5,000 commonly occurring SNPs—many of which have already been associated with other diseases. Using this methodology, the research team identified six new genetic variants that also increase the risk of suffering from CAD. Subsequently, the researchers wanted to examine the phenomenon that hereditary risk factors are associated with different diseases more closely—which they did in the most comprehensive analysis of this kind to date for the known 62 CAD risk factors. The basis for this project was the GWAS Catalog, where the results of all published genome-wide association studies are recorded. The researchers described in their results that a third of the 62 SNPs were associated with traditional risk factors for CADs, for instance, high blood pressure or cholesterol values. While these results were not surprising, nearly half of the SNPs also play a part in completely different diseases, such as schizophrenia or migraines. Interestingly, the scientists noticed a variation of chromosome 12 that was particularly striking, since it is a risk factor for 17 other diseases or disease characteristics, including rheumatoid arthritis, underactive thyroid, celiac disease, and chronic inflammation of the bile ducts. Although it is not yet clear how all this is related, these findings are very valuable, since they provide new starting points for clarifying how coronary artery diseases emerge and are thus important steps towards new therapies.